CNBA Review (www.cnbareview.com) - NBCE Chiropractic National Board Part 4 Review, Chiropractic National Board Part IV study notes, National Board Part IV videos, notes, study material, Chiropractic National Board Advisors (CNBA), Chiropractic Board Review Study notes. Welcome to the CNBA Review website. 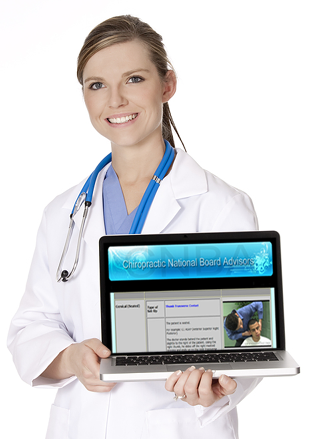 Here you will find information regarding the Chiropractic National Board Part IV Examination. CNBA is proud to introduce the first and most comprehensive Part IV web-based review system on the market. We are excited to present this web-based review to aspiring future chiropractors and perhaps to doctors taking the examination, and hope to make this review system an integral part of your learning experience. We wish you continued success in all your endeavors, and we are certain CNBA will fulfill your Chiropractic National Board Part IV educational needs and expectations. The video below shows bits and samples from each section of the review, and how the review works. Each section of the CNBA review contains and covers the most up to date information regarding the Part IV examination. As always, we'd love to hear your comments. E-mail us at cnbareview@gmail.com and let us know your thoughts. "I just wanted to take this opportunity to thank you for your fine review course; I originally graduated from chiropractic college in 1983, and after practicing for about a dozen years, wound up leaving practice to take advantage of other business opportunities. Here we are in 2013, and after retiring from business, had a rekindled passion to help patients once again. I took your course, and with some hard work, over 20 years later, and at the age of 58, easily passed the boards, and plan on restarting practice in about 2 months. I thank you on my own behalf as well as that of my future patients, as your course was an integral part of my success. "Just wanted to thank you." "Just wanted to thank you. Passed Part IV after 21 years out of school. Your review was excellent in helping refresh my memory and prepare me for the examination. Thanks. " "Wanted to let you know I have passed Part IV. In the end I passed very well so I would like to thank you for your review. The details are all there and it's just a matter of going through the program. Thank you very much." "I had unfortunately failed the Part 4 examination prior to taking the CNBA review. I was able to witness first hand how the test was given and what is essential to know to pass the exam. The CNBA review extensively covers what should be practiced to perform well on the exam. This review fully prepares the student for what will be asked as well as leaves NO room for error. CNBA makes sure that nothing goes left unsaid or undone in order to get the full amount of points at each station. The CNBA review, in my opinion, prepares students for EXACTLY what to expect while taking the exam. The scenarios and strategies described in the review are very similar if not exact to what I have witnessed while taking the Part 4 exam. The review provides much clarity, and as I have said leaves little to no room for error. I have taken other reviews, however with CNBA it is far more precise and and focuses on the specifics." "The CNBA review was very helpful and gave me great tips for the test as well. I would highly recommend this review to others!" " The CNBA review for the Part 4 national board exam was quite helpful for me. The review gave me confidence that I could indeed pass the exam. I had previously failed the Part 4 exam. However, by taking the CNBA review, I believe that it had a lot to do with me finally passing the exam this time. The review was very helpful and strategy based. I found that I asked the proper questions during the exam as taught in the review, which significantly helped me. I avoided a lot of useless studying time because of this review. I would definitely recommend CNBA's part 4 review for anybody taking the Part 4 National Board Examination." "I think the review offered by CNBA is very clear and focused. The CNBA review gave me confidence and helped me focus on the key things. The technique section as well as all the other sections of the review were very detailed and helpful. Once I took the Part IV exam, I realized how precise and helpful the CNBA review truly was. I walked out of the exam knowing I had passed. Thank you CNBA." "The review offered by CNBA is very detailed and emphasizes on the specifics. I felt very confident after taking this review. Thank you for all the help!" "I read this review in detail, and this may be the best written review I've ever run across. This is excellent. I like the pictures, the tables, the videos, and how the review is written and presented. Flat out great."